When you live in a state that starts to feel summery well before the rest of the nation's snow is melted (::cough:: Texas ::cough::) you learn to love hydrating foods like watermelon. Normally I buy huge containers of cubed watermelon from the store (convenience for the win) and keep it simple by shoveling it straight into my mouth when I'm sweaty, hungry, and/or exhausted. However, this all changed last year when I tried a watermelon salad recipe from my online friend, Kelly, who blogs at Primally Inspired. 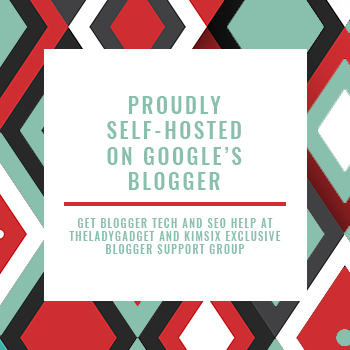 If you're not already a fan, you might remember her from my 13 Positive, Helpful & Inspiring People You Should Follow round-up earlier this year. Anyway, I'm on her newsletter list and when she shared a leafy watermelon salad recipe last summer--inspired by a meal she'd eaten at a local restaurant--I quickly tried it and posted on Instagram. It was INCREDIBLE! The best part was the coconut lime dressing. Slightly sweet and creamy with a bit of tang from the lime. Coconut + Lime = Perfection! I ate her salad several times over the course of the summer and every time thought "I need to figure out more ways to use this dressing". Of course, as with many of my fleeting food-related ideas, if I don't act upon them immediately, they get filed into the "someday" category of my brain to collect dust and maybe get resurrected in the future. Well, folks, today is that SOMEDAY! I've actually been jonesing to create both a jicama AND watermelon recipe (separately) for months now and then remembered Kelly's awesomesauce watermelon salad + dressing and a light bulb went off in my head. 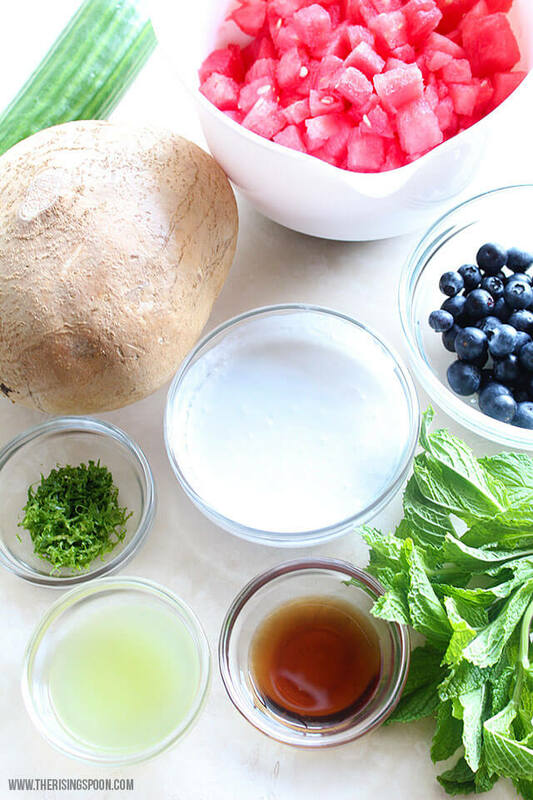 I decided to combine several fruits & veggies that I love to snack on raw in the summertime because of their hydrating properties and use a slightly tweaked version of the coconut lime dressing as a vessel to bring them all together as a refreshing salad. While I totally could have used her original dressing & just linked to that, I felt compelled to make a few minor changes to compliment the jicama and mint in the salad. Namely, to add more lime juice, in addition to some lime zest + use my favorite sweetener right now (maple syrup) instead of honey. I'm used to eating thin slices of raw jicama with fresh lime juice squeezed all over it, so I knew I had to bump up the lime. At this point you're probably thinking "Okay, Elaina, this all sounds great, but what the heck is jicama?" If you've never heard of jicama before, keep reading, because you need to try it. :P Yes, it's that awesome & I'm honestly surprised this food isn't more popular in the states (yet). Jicama (pronounced hee-cama) is a Mexican root vegetable similar in texture to a turnip but with an ever-so-slightly sweet taste like an apple. The best way I've seen it described is as a "savory apple"; however, it's much crunchier (not as crunchy as a carrot, just to give you a comparison) and more refreshing, in my opinion. You can typically find jicama root sliced into thin strips & sold in the prepared foods sections next to the sliced fruit. If not, look for whole jicama roots next to the turnips in the produce section. Important: Unlike other root veggies like turnips or beets, jicama is only ever sold as the root by itself, since every other part of the plant (leaves, seeds, etc.) is inedible and highly toxic if consumed. The peel is also thick, fibrous & inedible, so you'll need to peel that off first before eating. However, once that's removed (easy with a peeler), the pale white flesh of the root can be eaten raw or cooked. Jicama is low in calories & sugar, has good amounts of vitamin C and fiber + a high water content, so it's great choice for a healthy snack. You can read more about jicama health benefits + nutrition here. 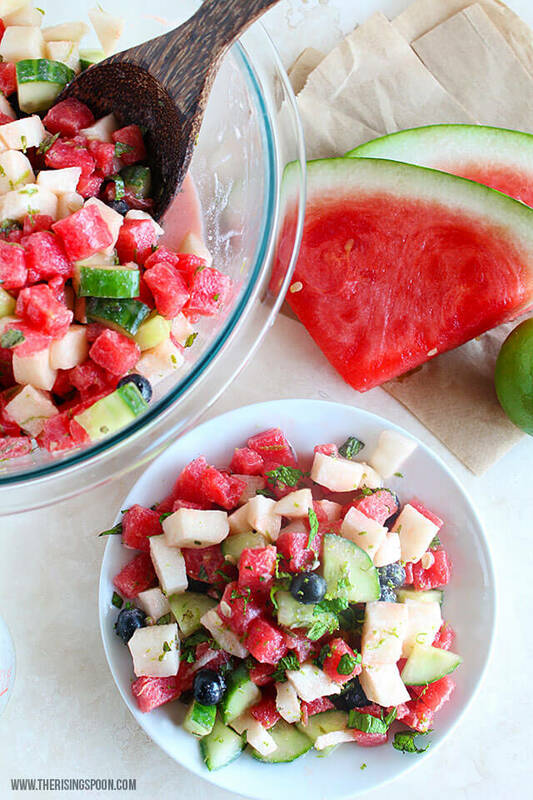 Okay, so back to the watermelon salad! This is my favorite snack/impromptu breakfast/side dish right now and when I made it last week it didn't last long. I even drank the bit of liquid gold at the bottom of the container. 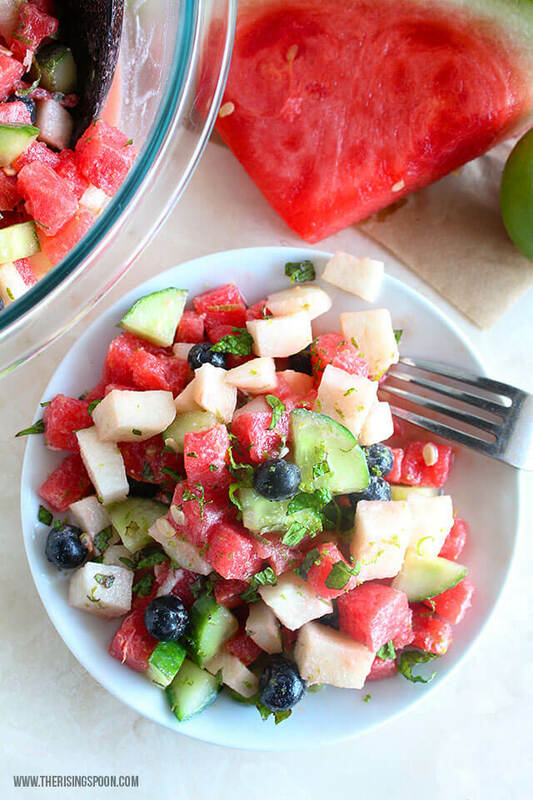 What Goes With Watermelon Salad? 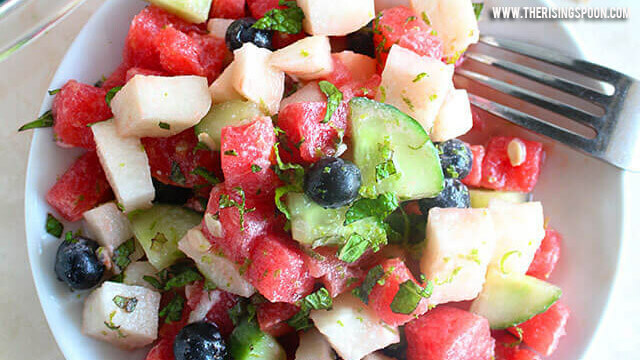 You might be wondering what to types of foods to serve with watermelon salad or any summery fruit salad recipe. Since this recipe has a mixture of fruits & veggies with high water content, it's pretty filling on its own. Because of this, I'll typically serve it with a lighter meal with lots of protein. Of course, this will also pair well with summertime favorites like burgers, steak, brats, BBQ ribs, and grilled veggies if you're doing a cookout! 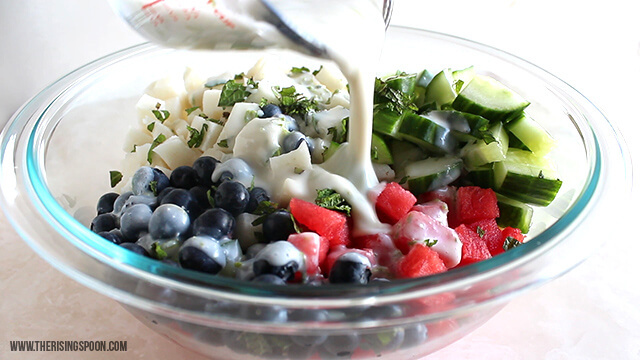 A healthy summer salad full of hydrating and cooling foods like watermelon, blueberry, cucumber & jicama root and topped with an addicting coconut lime dressing. 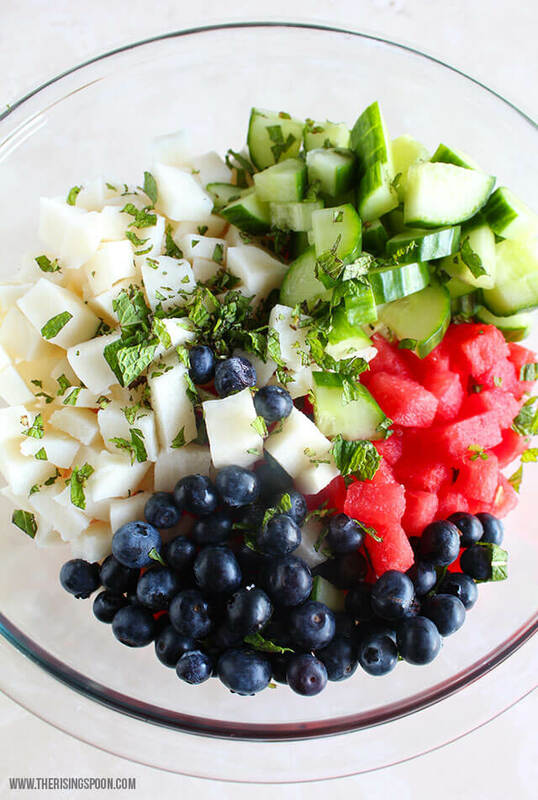 Combine the watermelon, cucumber, jicama, blueberries, mint, and sea salt in a large bowl. Prepare the dressing by mixing together the coconut milk, lime juice, lime zest, and maple syrup. Stir with a whisk or shake in a covered jar to combine. Taste and add more lime or maple syrup if you like. If you're prepping this earlier in the day or the day before, store the salad and dressing separately in the fridge. Why? Between the dressing & the watermelon, the salad starts to form a puddle of juices (albeit delicious) in the bottom of the bowl, so waiting to combine the two helps to keep the veggies crunchy & the salad prettier. Right before serving, pour the coconut lime dressing over the salad and toss everything gently to combine. Garnish with extra chopped mint, lime zest, and fresh lime juice, if desired, and serve immediately. Store leftovers in a covered container in the fridge and consume within 2-3 days so the veggies stay crunchy. 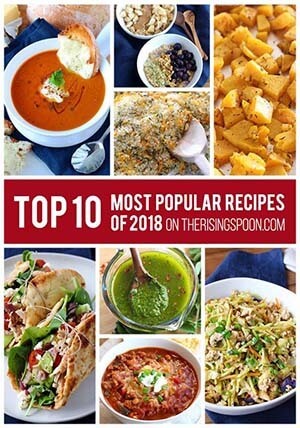 Click Here To Pin This To Your Summer Recipes Board! 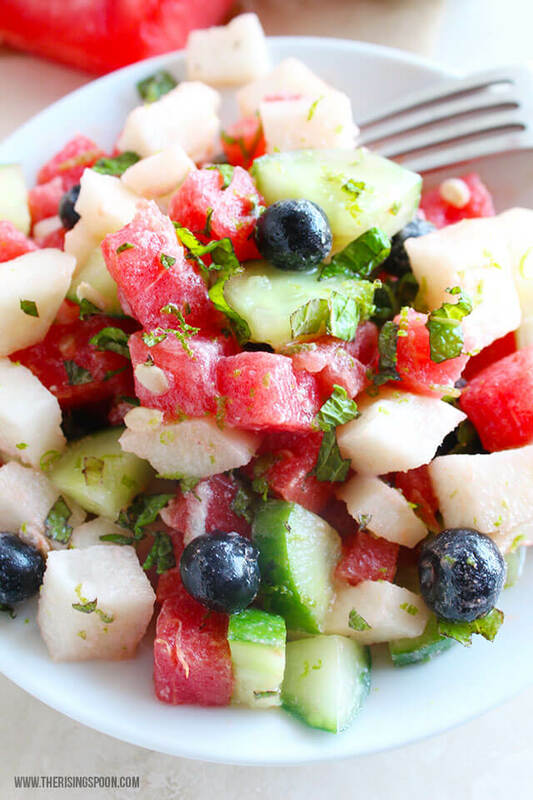 What's your favorite recipe that incorporates watermelon or cucumber?